California is the nation's biggest and wealthiest state by just about any measure. But is it big enough and wealthy enough to launch its own Medicare-for-all type of single-payer health care? We may soon find out. 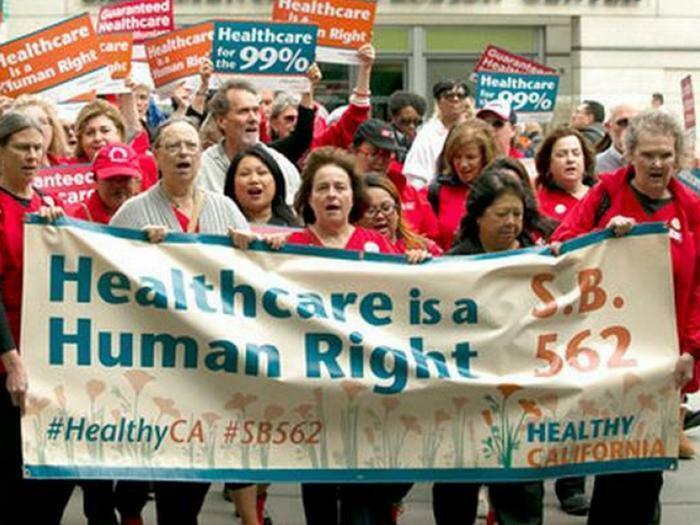 The California Senate has passed a bill backed by the California Nurses Association that would provide health insurance to every man, woman, and child in the Golden State, although it does not include a means of paying the projected $400 billion cost of the plan. The measure now goes to the General Assembly, where its fate is uncertain. The California deliberations will be going on while, in Washington, Congress continues to look for a way to replace the Affordable Care Act, known as Obamacare. In California, Sen. Ricardo Lara (D-Bell Gardens), the leading supporter of the bill, said it is needed to provide care for those who fall through the cracks of the existing safety net programs. “Despite the incredible progress California has made, millions still do not have access to health insurance and millions more cannot afford the high deductibles and co-pays, and they often forgo care,” Lara said during a floor debate on the bill, the Los Angeles Times reported. Republicans say the bill would bankrupt the state. The California Nurses Association has proposed raising the state sales and business receipts taxes by 2.3% to raise $106 billion of the annual cost. The rest would supposedly come from state and federal funds that now support Medicare and Medicaid in the state. The nurses have been the most fervent backers of the plan. Doctors have been relatively cool to the proposal and insurance companies have been the most highly critical. The California Medical Association, the state group representing 43,000 doctors from various specialties, has declined to endorse the bill. In a statement, CMA spokesman Joanne Adams suggests that her association would support a single-payer health care plan at some point, but not in the bill's current form. “CMA has policy supporting a single payer system provided it meets certain benchmarks -- the most important of which is demonstrating that the legislation would make appropriate investments in health care infrastructure including providers for Medi-Cal and private insurance holders,” Adams wrote to ConsumerAffairs. Perhaps not surprisingly, insurers have been the most outspoken in their opposition. “California should not abandon all the progress we have made in health care by blowing up our current system and creating single-payer,” said Charles Bacchi, President and CEO of the California Association of Health Plans, in a statement to ConsumerAffairs. “SB 562 would cause dangerous disruptions in health care coverage and quality of care for the millions of Californians who already have health coverage. Other states, including Vermont and Colorado, have tried to implement single-payer plans in recent years but have failed because of the cost and the disruption to existing health care systems.